Newton’s first law of motion states that every object will remain at rest or in uniform motion in a straight line unless acted upon by an external force to change its motion. Newton’s second law of motion is as follows: The acceleration of an object as obtained by a net force is directly proportional to the size of the net force, in the same direction as the net force, and inversely proportional to the mass of the object. 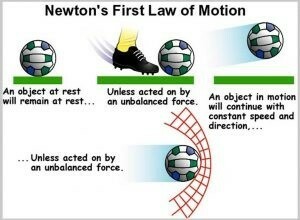 Newton’s third law of motion states that: For every action, there is an equal and opposite reaction. This means that in every interaction, there is a pair of forces acting on the two participating objects. 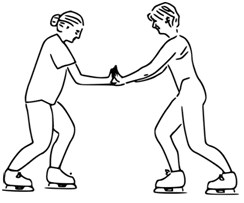 In the above picture: Skater on the left pushes the skater on the right (action). In turn the skater on the left gets pushed by the skater on the right (reaction). Here action is the ball thrown on the ground …The ball bounces back is the reaction. Newton’s third law states that every object will remain at rest or in uniform motion unless acted upon by an external force to change its motion. The acceleration of an object as obtained by a net force is directly proportional to the magnitude of the net force, in the same direction as the net force. 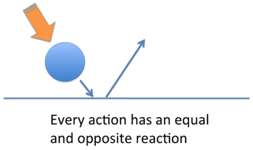 Newton’s third law states that every action is just an action with no expected reaction. The law of conservation of mass is same as Newton’s law. An object in motion will continue to be in motion unless acted upon by an external force to change its state. Newton’s first law states that every object will remain at ……… or in uniform motion in a …………… line unless compelled to change its state by the action of an …………………..
Newton’s third law is for every ……….., there is an equal and opposite………..